New nice bathroom with bath and shower. Car parking. Cellar for skies. Green terrace at ground floor. Note:non smoking people. Cozy apartment with excellent mountain views from the balcony! The apartment is on the top floor of a chalet. It is all warm wood inside and has two glass doors that open from the open living room onto a balcony with good afternoon sun...great for warmth and for drying clothes. The view is to the snow covered peaks of the Gran Murailles. You can not see Monte Cervino (Matterhorn) from here in Valtournenche. However, it’s only a 10- 15 minute drive further up the valley toward Breuil-Cervinia where you can see the magnificent peak. Definitely stop at Lago Bleu for a photo opportunity of Monte Cervino/ Matterhorn reflected in the clear aquamarine lake. Since the apartment is on the top floor the bedroom is under the eaves it does not have standing headroom. There is a very comfortable double bed at one end with sitting room only over the top part of the bed. At the other end of the room there are two twin beds. We slept very well here but we are used to living in a sailboat and a camper. So it depends on what you are able to handle. However, there are two twin bed size sleeping couches in the main room that can be used for beds too. Here you have full headroom and there is an excellent closet with good storage. We really appreciated the washing machine. There is also a dishwasher if you choose to use it. The owner Costanza lives in Milan but is very responsive to any questions about the property. She has an excellent information booklet on the apartment and she sends this by e-mail before your arrival. We loved the excellent location being 5 min. Outside of town with a good view of mountains and the valley & village of Valtournenche below. There are many hikes in the area with beautiful views. We especially enjoyed the trail 13 from Cervinia up toward the hut for Monte Cervino/ Matterhorn. There are great views of the mountain as you hike up. Another beautiful spot was up the road from the apartment toward Cheneil. There is a large parking area at Barmaz and a free small funicular that takes you up to the village. Great views and several hiking options. South of Valtournenche is a cable car which takes you up to the quaint village of Chamois. From there it’s a short but steep hike up to Lago Lod. For a mellow hike with great views we recommend trail 6 called the rus trail which loops out from the lake then back toward the village. Valtournenche has everything you need from a small but well equipped supermarket to bakeries, restaurants and bars for eating. Cervinia is closed until July 1st. Fantastic holiday in outstanding accommodation! My fiance and I had a wonderful time during our 3 day stay in Valtournenche/Cervinia, and this was a perfect place to stay. It was very clean. The view was incredible. And the owner was very easy to work with, and gave us all the information needed. Thank you for a wonderful stay. Perfect spot to stay for our skiing trip to Valtournenche. The chalet had everything you needed for self catering. 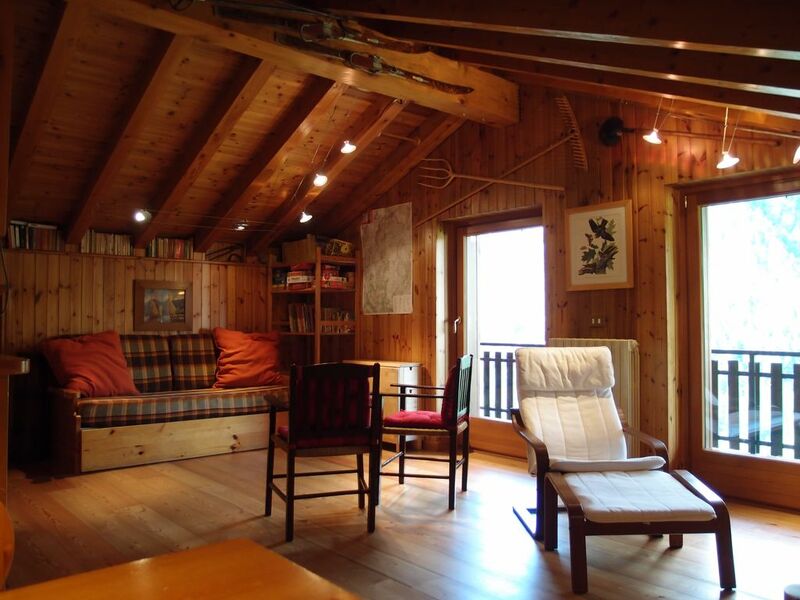 This is a lovely apartment; well-equipped and homely, in a beautiful, characterful alpine village. Easy access to the gondola which takes you directly to the ski slopes above Salette, leading to the main Breuil-Cervinia and Zermatt ski areas. We had a glorious week of blue skies, and warm weather, but with enough late season snow for good skiing too, and the extra bonus of pleasant evening walks as well. Costanza communicated very well, and we felt very welcome. Highly recommended. Next to Gran Paradiso Park. Starting point for climbing, trekking, mountaineering, paragliding, skying. Wonderful trekking either for adults or children. Ten Km far from the charming Cervinia Village. Weekly market in the old part of the small Valtournanche village. All facilities to be easily reached. Swimming pool and golf ground ten km far (in Cervinia village). Tennis court, playground, cafè, restaurant, pizzeria, all kind of shops in the old part of Valtournanche village (fifteen minutes walking from the chalet). Sky school, sky tracks connected to Switzerland. Ice skating. Both cross country skying and down hill skying.